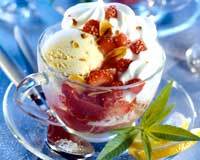 Fruit Ice Cream is a very popular recipe. Learn how to make/prepare Fruit Icecream by following this easy recipe. Take the fruit pulp and blend it with the other ingredients in a blender. Keep it in refrigerator for 30-45 minutes and take it out. Again blend it and refrigerate. Fruit ice cream is ready to be served. Decorate with tiny pieces of nuts.